This time of year has long since been associated with having a big clean-out to make things feel fresh and new. This kind of thinking can be applied to the office in two ways: de-cluttering the physical workplace and refreshing the business itself. Company owners can spring clean their brand as well as clean the office. A clean workspace can increase productivity and employee satisfaction, whereas a revamp of the company can attract new business and boost profits. The business may be attracting an audience for removed from the original demographic it was created to target. Company owners should have a clear out of their customer base, removing any irrelevant contacts. This will allow bosses to see who their products or services are attracting, and they can base their advertising around this type of customer. Spring is an excellent time to evaluate whether the business is still competing with rivals. Do owners need to update their offerings? For example, does the company website need improving to be more interactive? Are there certain products or services that could be dropped as they cost more to produce than they make in profits? Generally, reception is the first place a customer sees when they enter a building and its appearance could help shape first impressions of the firm. What does your reception say about your company? Refreshing a dull space with a coat of paint and replacing outdated or damaged furniture could tell consumers you mean business. Finding the right method of communication is a keystone for a business’ success. Is your current strategy still effective? Is it still attracting customers? Companies that rely solely on email or post to advertise and communicate may find consumer responses are somewhat lacklustre. The rise of social media has made an effective tool to reach out to an audience to promote goods and services, as well as asking them what they want. Spring is an excellent time to invest in these tools or to brush the cobwebs off existing accounts. In every office there is a corner, or small room, where damaged and irrelevant bits of junk are squirrelled away. These broken chairs and busted computers clutter the office, taking up space that could be better used. They also create hazards that could lead to an employee hurting themselves while trying to navigate around abandoned rubbish. Business owners should either hire a skip to get rid of the junk or employ movers to take the junk away. The old adage ‘tidy room, tidy mind’ can be applied to every employee’s workspace. Mountains of paperwork, empty drinks bottles, broken pens and dirty mugs will all get in the way of a productive day. 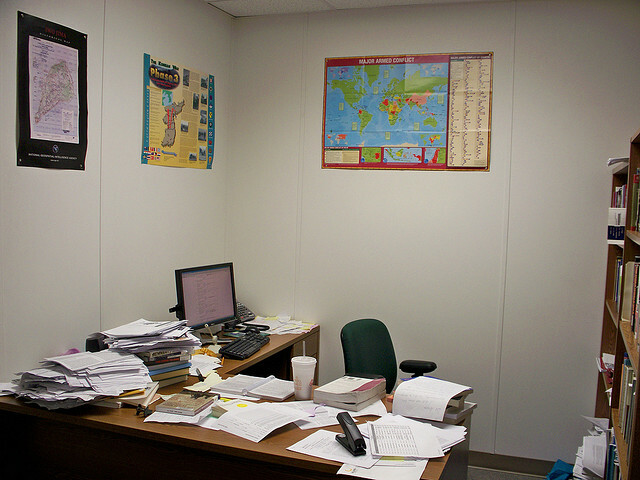 Staff should be encouraged to spring clean their own desks, recycling where possible and binning everything else. An employee should only have things they absolutely need to do their jobs at arm’s length, if it’s not needed it can be thrown away! It’s a good idea to call in a cleaning contractor to tackle larger jobs, such as deep cleaning office kitchens and shampooing carpets.